Another holiday season, a herd of family I can’t wait to see, all with their convoluted schedules, none of which coincide simultaneously. Therefore, I’ll be turning the holidays on and off several times in the next couple of weeks. I’ll be flexible. I’ll be creative. I’ll try to stay sober. I’m thinking small plates and bite-sized packages by the fire will be appreciated. In a holiday stuffed with excess, less can often be more. Guests tend to eat slower, lingering over small plates. And in-between the plates, the conversation flows. Freshly shucked oysters with a mignonette, followed by a couple of small pieces of buttery brioche topped with lemon creme fraiche and a smear of the most delicious roe your purse will allow. A sparkler, of course. Less is more, unarguably. How about one perfectly seared scallop on a bed of wild mushroom risotto in a ramekin. Any protein and starch combination you particularly love can be scaled down; it will be savored all the more when downsized and served on a small plate. 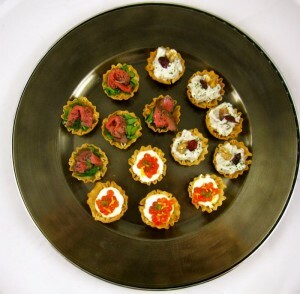 For dessert serve chocolate mousse and a dollop of Grand Marnier enhanced whipped cream in phyllo cups. Meatballs may be made in advance and frozen for up to a couple of weeks. My freezer is an ally. 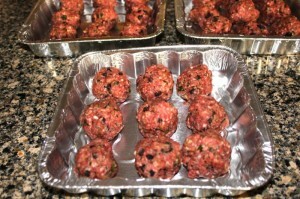 The lamb meatballs in the following recipe were divided into aluminum pans, and then frozen. I take out a tray and bake them as needed. A garlicky tart tzadziki would be the perfect accompaniment, but I chose to drizzle pomegranate syrup/molasses onto the plate, then top it with the lamb. 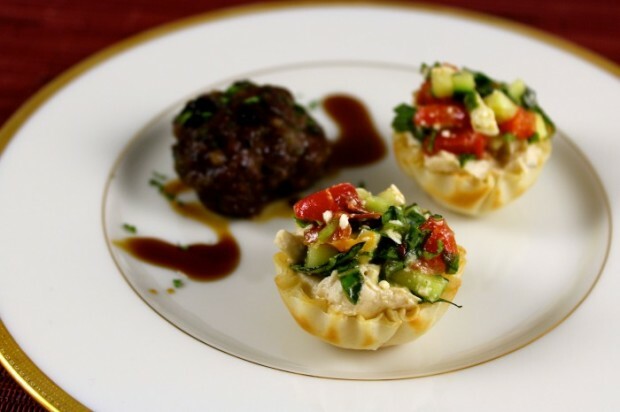 The lamb meatballs pair especially well with phyllo cups stuffed with mediterranean ingredients you’ll find in the recipe below. Here’s another recipe (Inside Karen’s Kitchen) that inspired mine; she bakes her phyllo cups and the ingredients include sun-dried tomatoes and kalamata olives. Most quality groceries stock phyllo cups next to the frozen phyllo sheets in their freezer sections. They thaw in 30 minutes, then I stuff them with a variety of ingredients through the holidays. Again, here’s the link to my collection of other stuffings for phyllo cups made in the past. Phyllo cups may be found in the frozen section of most grocery stores, saddled next to the phyllo sheets. So flexible and versatile, what’s not to like? Good things come in small packages. Have a lovely holiday season! In a large bowl, whisk eggs together with garlic, salt, pepper, cayenne, cinnamon, currants and cardamom (if using). Stir mint and panko into seasonings to combine. When ready to serve, preheat oven to 350 degrees. On middle rack of oven, bake (thawed) lamb 15 minutes. Serve with pomegranate syrup garnished with orange zest, if using. Divide hummus or baba ganoush between phyllo shells. Combine cucumber, roasted red pepper, feta cheese and basil or mint; add freshly ground pepper to taste. Evenly between the shells and serve. *I used the Athens Mini Fillo Shells brand, found in the freezer sections of most groceries. I love those lamb meatballs but I am so glad that I saw the shaved brussels salad with marconi almonds and monchego cheese as we made this once and it was delicious and I had forgotten all about it until I saw the recipe again at the bottom of your small plates post. So true. Honesty and everything renczoiged.